An amazing Mata Gurjeet Kaur whose faith in Waheguru and strength of spirit has not waivered even in the face of such tragedy. Please read her story, spoken in her own words: Mata Ji lost a husband, a daughter and 4 sons at the hands of the Indian State. 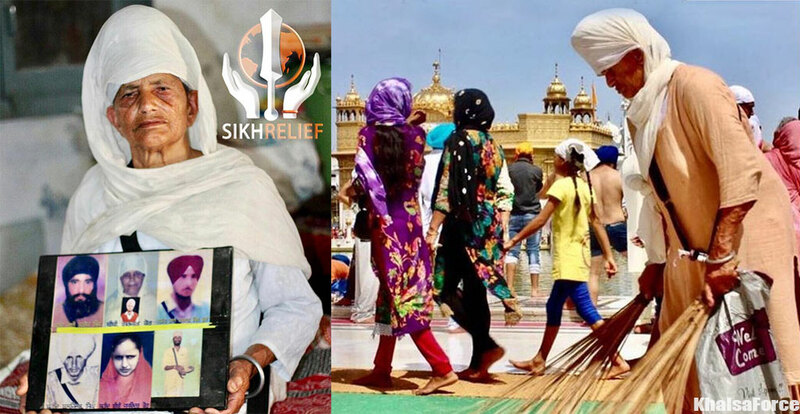 For the past 26 years she has dedicated her life to seva at Harmandar Sahib in Amritsar, now she needs OUR help. This is her heartbreaking story…. She lost everything at the hands of the brutal Panjab police. Seeking the strength and shelter of Akal Purakh, she has managed to carry on for the last 26 years…..a living testimony of the fake encounters carried out by policemen, who remain in positions of power, even today. “I have been left all alone in this world. Army soldiers killed my husband Gurmej Singh and our young daughter Jasvinder. Gurmej Singh was a deeply religious man who visited the Golden Temple at least once every month. He was also an ardent admirer of our forward thinking leader Sant Jarnail Singh Bhindranwale and believed in his vision. In June 1984, he left our home in the village of Sodhiwala, in Punjab’s southwest border district of Ferozepur, along with our elder daughter – who was only a young child at the time. They were inside the temple when the army launched its attack. Since that day, Gurmej Singh or Jasvinder have never returned home. All I know is that they were among the thousands who were killed by the army that day. We couldn’t even perform their last rites. To add to our grief, the Police began harassing us because they recovered some pictures of Sant Bhindranwale which my dead husband had bought. My eldest son, Kashmir Singh who was 22 years old and worked as a mechanic at a nearby workshop, was picked up by Police and killed. They threw his body in a drain outside the village. Intensely angry over the injustices we kept being forced to suffer, two of my younger sons left home to join the freedom fighting movement. I did not attempt to stop Jaspal Singh or Tarlok Singh from going away. I do not know if they were able to avenge the deaths of my husband, daughter and older son, but some years later – around 1991, both the boys were shot dead in encounters with the Police. I did not grieve – they had given their lives while serving the cause of the Panth and the Guru’s. We would like to thank the global Sangat from our hearts, for the generosity shown in supporting Mata Gurjit kaur ji. She has endured so much in her life. We are only able to do this seva with your love and blessings. Let us continue this incredible journey together and support those who have sacrificed so much.